DON’T WAIT – BLUEHOST HAS A DEAL JUST FOR MY READERS RIGHT NOW FOR $2.95 PER MONTH!!! Well, it’s a lot easier than you think it is to start a blog. Let me repeat that. IT’S EASY, Y’ALL. Which is why today is the day to start that blog you’ve been thinking about. I know that starting a website can sound daunting – like you need a PhD to put this show onstage. But that’s simply not true. I was, and still am, a regular ole internet-using person. No fancy degree. No amazing credentials. And I’m making a great living blogging. In fact, starting this blog has been the best professional decision of my life. Within months I had left my boring job, started paying my bills with blog money, and paying off my credit debt at break-neck speeds. And every month I make more money than the month before. And you’ll be set up and running in about ten minutes! As if that weren’t enough to convince you to try out blogging, the costs of starting this business are less than that of a latte. AS LOW AS $2.95 PER MONTH THIS WEEK ONLY! The only purchase you’ll need to make is for website hosting through Bluehost. But we’ll get into that in a minute. Please note that some of the links below are affiliate links and I will earn a commission if you purchase through those links. I have used all of the products listed below and recommend them because they are helpful and are companies that I trust. Thanks for helping to support Sewrella! Think about what you want to describe your brand. Come up with a few ideas, as they might be taken. Bluehost is a web hosting service, basically what they do is rent you a space on the internet for your website to live. FOR AS LOW AS $2.95 PER MONTH! Now that’s a deal, friends. There are lots of these hosting companies out there but they simply aren’t as great as Bluehost, as my experience with their customer service has been incredible. Bluehost is also the easiest hosting service to use – you can complete every step of this guide through their interface in one place! With other hosting companies you’ll be jumping through all sorts of hoops to get your domain name hooked up to your hosting, and your hosting installed on WordPress. Are you confused yet? Me too. Just use Bluehost. Once you find your domain name, choose your plan on Bluehost. 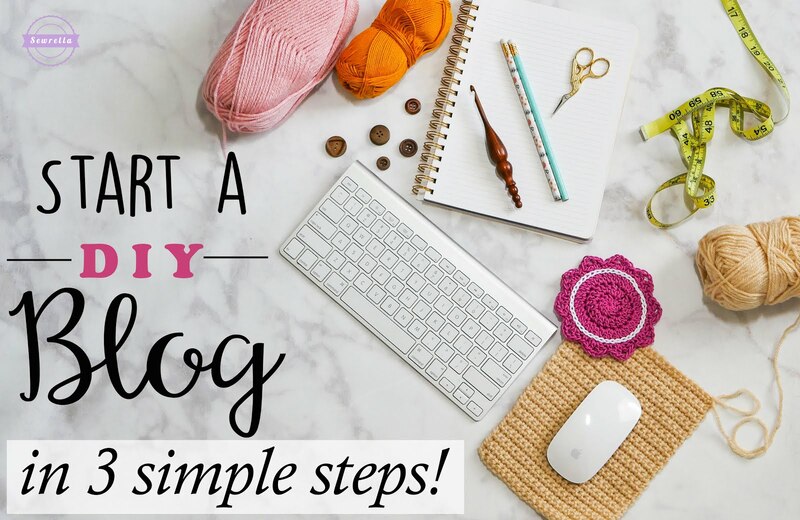 I recommend the basic plan to all new bloggers as it’s really cheap to get started and will cover everything you need (it includes your domain name for free!). You pay in one lump sum for the next 12 months, but doing it this way will save you some serious cash. And remember: you’re starting a business! There will be some cost upfront, but Bluehost is so reasonably priced for the quality and ease you get in return. ALSO: I know what you’re thinking – can’t I just start a blog on another free blogging platform and save the cash? Sure you can – but your blog won’t earn you an income worth mentioning. I started blogging on one of these platforms and it was awful. I spent hours and weeks trying to fix little problems, learn to work on html coding myself, and other mind-numbing tasks. My site looked unprofessional and I had a hard time monetizing it. Also, I spent very little time creating the content that would make me money! Once your domain name is in place and you’ve chosen your plan, you’ll see a page that looks like this. You don’t need any of the ad-ons listed under “package information” to get started, but they are some more options for you to look over if you so choose. WordPress is the blogging software that you’ll use to publish posts and make edits to your site (it’s the software almost every serious blogger uses). It’s free to install and Bluehost does it AUTOMATICALLY for you. See? Told ya it was easy. Login to Bluehost using your new account and login, and pick your theme. Don’t worry, you can change this (or apply a custom theme) later! Now, let’s login to wordpress! Get to know your WordPress dashboard with all of those tools along the left side (you’ll get to know these very well throughout your blogging career! )/ The Bluehost setup help tools are awesome too, so be sure to utilize them! Input the appropriate information and get ready to blog! *You can login later by: typing your Admin URL into your web browser (usually your domain with /wp-admin on the end, i.e. http//www.yourdomain.com/wp-admin). You’ll see a login screen like this one. Enter your Username and Password you copied down from the previous step. You’re now logged in online and officially ready to start blogging – congrats! This part is my absolute favorite! This is where you get to get creative and decide how your website will look, unique to you. Because, you know, you’re a blogger now. You’ll need to make your blog a bit prettier than it looks now, that encourages people to visit your blog again and again! You can pick from some free blog templates (or themes) that WordPress gives you. You can see those here – but I’ll be honest, they’re not my favorite. Just CLICK HERE and click “WordPress Themes” to browse some layouts. When thinking about design, I urge you to take your blog seriously. Again, this is your business. And even if you’re not sure if it will turn into a career, treat this journey as such. Take your hard work seriously and invest the little bit of money into making your blog the tailored place for readers to visit and stay. After all, you’re selling an experience to the reader. How you do want that experience to look? Check out these other articles to help your blog grow into a profitable business! Still unsure? See my real income reports HERE! I hope to see all of your blogs come alive soon! Comment below with the link to your new blog so we can all check them out!